Liv Kristine is best known for her work as the vocalist for Leaves’ Eyes and former singer for Theatre of Tragedy. As well as fronting one of the most iconic symphonic metal bands on the scene, Liv is also a solo artist and has collaborated with a number of different bands including Cradle Of Filth, Atrocity, Delain and most recently she appeared on the track The Lay Of Our Love, which is featured on Tyr‘s new album Valkyrja. Nico: Hi Liv, how are you doing? Liv: I’m good thank you. It’s been a busy day, but in a positive way, you know. Lots of interviews and we’re rehearsing because we’ll be playing the Metal Female Voices Festival in Belgium in a couple of days. I’ll be there with my solo band on Friday and with Leaves’ Eyes on Saturday so yes, we’re busy! Nico: Sounds like you’ll be having fun though. Is there a meaning behind the title of the new album Symphonies of the Night? Liv: Um, a meaning or the concept in general? Nico: A bit of both really. Liv: Okay, well we came up with the title pretty late in the recording process. I actually had a song called Carmilla from Sheridan Le Fanu’s horror novel from 1871. So the song, which came to be titled Symphony of the Night, was originally titled Carmilla. But we were discussing the title within the band and we weren’t really sure. What happened was pure luck: I was typing an interview and the journalist was asking me about my influences and I mentioned Tchaikovsky, who wrote the Symphony of the Swan Lake and I thought that’s it! This is an album of eleven symphonies of the night, so there we go! So Carmilla is still the main character in the title song, but the title got changed. Things happen, we are a very creative band. Nico: I was listening to the previews of Symphonies of the Night that Napalm uploaded to YouTube earlier. There is a definite evolution in the band’s sound, changing direction compared to previous Leaves’ Eyes albums. Is this what you were aiming for with this album, and will this be a future direction you will be taking for future releases? Liv: Well, I’d rather put it this way: Leaves’ Eyes isn’t a planned thing when we start composing. We throw everything into pre-production and what was already there, were two songs: Eileens Ardency and Saint Cecilia. They just didn’t fit on the Meredead [released in 2011] album when it comes to atmosphere. So they weren’t leftovers but they were on no album after the release of Mededead, so we decided to start working on them. And then we realised that this was a good point to start from. You know, this year we have the anniversary of 10 years of Leaves’ Eyes so we have experienced a lot of being on the road, and all these albums we released and we’ve gathered a lot of experiences. For most of the band members Leaves’ Eyes is twenty, twenty five years of experience. Everything is there on this album, you won’t miss anything. It’s a very powerful album, I agree on that. Nico: On previous Leaves’ Eyes albums the use of different languages made an appearance on the tracks. Will this be the same with Symphonies of the Night? Liv: On Symphonies of the Night we’ll have modern English of course, Shakespearean English, some Norwegian, a little bit of French and a little bit of Irish. That’s five languages, I think on the Njord album we had eight languages and on Meredead six languages. I just love languages and I studied linguistics for years so it’s something I really like doing. Nico: What would you say is the track that stands out on the new album? Liv: Well that’s the most tricky question you could’ve asked me. Right, um.. This morning in my car I was listening to Ophelia, which is the final track of the album. Of course it’s Shakespeare’s Ophelia, the daughter of Polonius, in Hamlet. That’s my main character, and Ophelia is a quite straightforward and rocky song. It might sound like it doesn’t have a complicated structure like for example Saint Cecilia or Nightshade but Ophelia was the second to last song we recorded. We needed quite a lot of time for Ophelia to finish it in the way we wanted it. All of us: Alex, my husband, our producer, Thorsten my red-haired guitar player and myself are perfectionists. It’s great to have our own studio because then we can keep working until the three of us are satisfied. Ophelia was a tough one but I think it turned out great and at the moment it’s my favourite, if I’m allowed to have one. Nico: You recently featured on The Lay of Our Love which is on Týr’s latest album Valkyrja. What was it like, recording that track with Týr? Liv: Actually, I recorded my vocals here in our studio in Germany. But every time I think about doing a duet it’s always the music itself which decides. If I like the song I’ll do it. Heri from Týr helped me out in Wacken last year when Leaves’ Eyes headlined Wacken Open Air. He helped me out on Solemn Sea, one of our tracks. So when Heri asked me ‘Liv would you mind? I have a duet and you would fit very well on it’. I just loved the song and I have good news because we’ll be shooting a video clip for that track in a month! I’m really looking forward to that, it will be in Belgrade. Nico: Ooh, excellent! I’m looking forward to that. With the recent collarboration with Týr, do you think it will help expose Leaves’ Eyes to Týr fans and Týr fans to Leaves’ Eyes? Liv: I hope so, I really hope so! If Heri wouldn’t mind, we should tour together some day cause I think we have a potential common fanbase. The thing is, Leaves’ Eyes hasn’t toured a lot in Scandinavia. We should to that very soon, especially in my homeland. Týr is very well known in Scandinavia so that would be an absolutely amazing package. Nico: I completely agree. A Leaves’ Eyes/Tyr tour would be amazing. Liv: Thank you. We now have told the universe. Nico: Speaking of touring, Leaves’ Eyes is scheduled to return to the UK next year in January with Atrocity and Pythia. Are you looking forward to the tour? Which cities are you excited about? Liv: Absolutely! We toured the UK and Northern Ireland last year with Firewind and that was absolutely amazing. We played at places where Leaves’ Eyes had never played before and for Firewind as well it was absolutely amazing. I remember Cardiff very well because I spent a couple of months there when I was an exchange student. So Cardiff is pretty well-known to me. But of course Manchester is always packed, London is always packed. We will play in some of the venues we played with Firewind as well. We’re building up a fanbase in those places so I’m really looking forward to be back over there in the UK. We have an amazing fanbase in the UK and Northern Ireland. I was really surprised to see that there are so many fans who know about our music in the UK, and many journalists as well. I’ve had quite a few UK interviews this week so that’s good. Nico: Last time I interviewed you, which was in Manchester last year, when Leaves’ Eyes was there with Firewind, you mentioned that you were a fan of Game of Thrones. So, if you could be any character from the Game of Thrones universe, who would you be and why? Liv: That’s an even trickier question than the one you asked me before! Oh dear, oh dear… I’m not really sure. It must be Daenerys. Well okay, she’s blonde so it should be her. Nico: She’s a good, strong character. Liv: She’s great, she’s amazing yes. Nico: Going back to touring, are there any future plans for you to tour your solo project around the UK? Liv: I hope and pray that there will be next year because it’s certainly time to play some solo shows in the UK as well. The only shows I have this year for Liv Kristine, for my solo project, is Nagold in Germany and Pratteln in Switzerland. So those are the two gigs, but they are exclusive gigs. Leaves’ Eyes and Atrocity will be touring most of the rest of the year so we will be very busy. China, Taiwan, Thailand, Russia, Romania, Bulgaria, Germany, Belgium. Lot of things happening! The end of December is the right time for exclusive solo shows but the UK, 2014..let’s cross our fingers. Nico: That’s what I’m hoping for. Nico: Speaking of shows. I’ve heard a few whipserings around the internet from associates of mine that Leaves’ Eyes might be playing the Dames of Darkness festival in the UK next year. I was wondering if there is any truth to this? Liv: Wauw, I mean that would be absolutely killer! It would be fantastic. Well you know, bookers know things before the rest of the band does so..let’s make it happen. Nico: I hope it does happen because Dames of Darkness this year was phenomenal and it would be so much better if Leaves’ Eyes was playing it. Liv: Thank you, thank you very much! I’d love to be there. Nico: Last question. This is a fan question, asked by April Mccaffrey: if you could have a superpower, which one would it be and why? Liv: A superpower… Okay, you took me by surprise there! When I was a kid I always thought it would be fantastic to be able to look into the future, to know what is going to happen. But I’m not sure if I need that anymore. It’s a very good question actually. Sometimes I wish I could change things for the better of it. Sometimes, especially when it comes to children and children suffering on this planet, it feels like we are just sitting here being comfortable and warm while on the other side of the planet children are dying because of hunger. That’s when I think I would just like to be able to beam myself to that place and do something. Maybe that’s a project for the future. If I ever get tired of playing gigs and singing that would be something I would like to do, to be part of helping projects concerning children who are suffering on the other side of the world. Nico: I wasn’t expecting that answer. You’re certainly a kind and caring individual. Thank you for your time Liv, I hope you have a good night. Liv: Thank you very much, it was a pleasure talking to you again. Take good care and hope to see you in Manchester in January. Nico: You too, Liv! Have a good night! After such an intense worldwide tour in support of their “Serpent Sermon” album, Marduk aren’t ready to leave the stage yet. 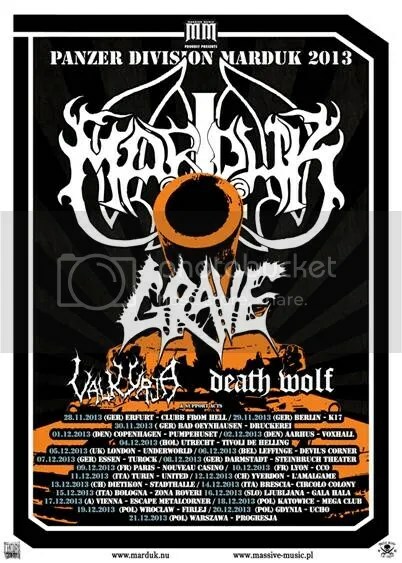 They intend to march over Europe and play “Panzer Division Marduk” in full. Also, as “Those Of The Unlight” celebrates its 20th anniversary this year, Marduk have decided to play that entire album as well..
Hailing from the Faroes come Týr, one of the the biggest and most influential Viking metal bands of today. Following their jump from Napalm Records to Metal Blade, the four piece soon would finish Valkyrja, the band’s seventh full-length studio album. The album’s main concept is the story of an unnamed warrior who leaves his wife in order to impress a Valkyrie so that he can gain entry to either Folkvang or Valhalla. Blood Of Heroes opens up the album in a truly powerful manner. The opening passage signals a change of sound in Týr‘s music whereas the chorus is typically catchy, something that has become a trait in Tyr‘s music over the last couple of releases. Mare Of My Night follows, which Heri describes as being the song that he has ever written the most sexually explicit lyrics for. The song focuses on a strong driving sound with an equal measure of melody to accompany the propulsive riffs. Hel Hath No Fury, which is a brilliant play on words regarding the supposed Nordic goddess of death Hel, has a cold and furious streak woven into the guitars and a hook in the chorus. The Lay Of Our Love begins with the typical elements of a ballad, something which is enforced by both Heri‘s and Liv Kristine‘s vocals. The guitars paint a near-romantic image with different shades of emotion contrasting with the vocals where as Nation is the complete opposite, charging in for a frontal assault of melodious passages and aggressive vocals with reinforcements from a heavy bombardment of drums. Another Fallen Brother focuses on a more thrash-like use of guitars, with near-power metalesque vocals and a cumbersome use of bass and drums. Grindavísan starts with a folk-like choir before the majestic riffs domineer the song. As the song becomes heavier, so do Heri‘s vocals while the folk choir make an appearance for the chorus, adding a new spin on the song and keeping it traditionally Týr sounding. Into The Sky makes for a somber metallic dirge before leading into the highly melodic and medieval sounding Fánar Burtur Brandaljóð, which is sung in a Nordic language, presumably Faroese. Lady Of The Slain, which is one of the names given to the deity Freya, comes racing in like a horde of warriors drunk on blood and glory. The guitars cut through the track like a knife through butter, allowing for the bass and drums to leave their own path of devastation. The title track, Valkyrja, has one of the most solemn introductions on the whole album, allowing varying levels of emotion to ring out through each note. Where the faster paced aspects of the track bring a vast amount of power with them, allowing the snarling use of riffs to roar fiercely throughout the song. The album ends with two covers: Where Eagles Dare (Iron Maiden) and Cemetery Gates (Pantera) – Both of which are performed superbly with Týr‘s own unique twist on them. Valkyrja is a change in direction for Týr, stepping forward with their sound but allowing for some room for certain sound sand elements from previous albums, making for a fusion of old Týr and new Týr. Valkyrja is probably the best album they’ve released thus far and definitely shows how much their sound has evolved since How Far To Asgaard. Týr hail from the ancient Faroe Islands, which are steeped in Viking mythology and history – The kind of stuff that makes up the lyrical basis for Týr‘s music. With the release of the band’s seventh studio album, Valkyrja just around the corner, Nico has a chat with Týr bassist Gunnar Thomsen. Nico: Valkyrja is Týr‘s seventh studio album. How will it differ from previous releases? Gunnar: It’s not that different from the others. Just much better, and more up beat tempo and dedicated to women. Nico: The concept of Valkyrja is loosely based around an unnamed warrior attempting to impress a Valkyrie so he gain entry to either Folkvang (Freya‘s hall) or Valhalla (Odin‘s hall). What inspired you to write the story around this? Gunnar: Usually whatever is on Heri‘s mind at the time, so in this case, life and women. He has had this concept for sometime now. Nico: Obviously the Valkyries will be playing a role in the story concept that will be running through Valkyrja, will any other figures from Norse mythology be making an appearance in the lyrics/story line? Gunnar: Heri always likes to put the Norse mythology into the lyrics, so there is other figures to in the story line. He also likes to use mythology with current themes today, as in the case of the previous album, The Lay of Thrym. This time it is about woman. Nico: Aside from the aforementioned story concept, are there any other lyrical themes that will be appearing throughout the new album? Gunnar: No themes as such but every song on the album has its own tale to present. Nico: You collaborated with Leaves’ Eyes vocalist Liv Kristine on the track The Lay Of Our Love. How did this collaboration come about and do you feel it will open up Týr‘s music to fans of Leaves’ Eyes who may have not listened to Týr yet? Gunnar: Heri suggested the idea to present her on one of the songs, course she has a wonderful voice and originally we intended to have more guest appearance on the album, but we decided that one was enough. Of course we hope to get more listeners, for Týr, but this is not why we asked Liv Kristine. Mainly just admiration for music. Nico: Describe the new album in five words or less. Nico: Kári left Týr before the recording process for Valkyrja began. How has this affected Týr‘s overall sound and the sound of the new album? Gunnar: Of course this affected the drum sound a lot but it also created a new and interesting atmosphere in the music. We will always miss Kári, and best wishes for his health. Nico: Speaking of the recording process for Valkyrja, you enlisted George Kollias as drummer for the recording process. What was it like to work with one of metal’s most accomplished drummers? Gunnar: He was absolutely astonishing to work with and he has a exceptional ear for music, and a lot of great ideas for how to put it together. He has a great personality. Nico: Týr are set to return to the UK in October as support to Finntroll. Will this run of UK dates be in support of the new album or will you be returning to the UK later to support the new album? Gunnar: This will be to support the new album but we hope to get more tours in England and plans are already being discussed for 2014. Nico: While we’re on the topic of touring, following Týr‘s sold-out headline show in York last year at the Jorvik Viking Festival, are looking forward to playing the UK again? Gunnar: YES! We are always looking forward to play in UK. We don’t do it as often as we would like and we love you Brits. Nico: If could you meet any figure from the Viking Age, who would it be and why? Gunnar: Of course Týr, the god of war. “Who else”? Nico: If you were trapped on an island and could only listen to only one album until you were rescued, which one would it be and why? Gunnar: Peace of Mind by Iron Maiden. And why? its the best album in this world. Nico: Do you have anything you’d like to say to our readers? Gunnar: Looking forward to see you all on the UK dates. We are looking forward to present the new album. Thank you for your support. we hail you Brits. Hail to the hammer!